Not that anybody needs to know, but a major job function that I have is performing chemical analysis by high performance liquid chromatography (HPLC or LC). This is an analytical technique used to monitor purity of many different classes of compounds, such as pharmaceuticals, foods, petroleum and oils (which are better analyzed by gas chromatography), proteins, and the list goes on and on. So that you can all understand, I will describe LC in the simplest terms possible – and (sorry to be cliché) I ask that you stay with me, because I can guarantee you will learn something. LC separates compounds in a mixture. An LC instrument is comprised of a pump, an injector, a column otherwise called stationary phase (which is a glorified tube of packed sand), and a detector (which is a glorified light bulb in most cases) – all basically in series (i.e. flowing in that order). What you do is pump liquid (mobile phase) through this system, inject your mixture onto the column, and as it flows through the detector, you get peaks corresponding to the components of your mixture. The premise is that the pressure that the packed column exerts back onto the system and the difference in how each component in the mixture interacts with both the mobile phase and the particles in the column contribute to different molecules remaining on the column longer than others, giving you a separation. The art of brewing espresso is actually a science that is analogous to LC (well minus the injector part, but who cares). Your bulk coffee is the stationary phase, water is the mobile phase, and your mouth is the detector. I’ll come back to this in a minute. If you take coffee grinds in a funnel with a filter under it, and flow cold or room temperature water over it, you might get a few drops of something that resembles muddy water. The pressure is atmospheric pressure, which really isn’t that strong, but if you use hot water (sub boiling), you might get a cup of american style coffee, as long as your grind is right. 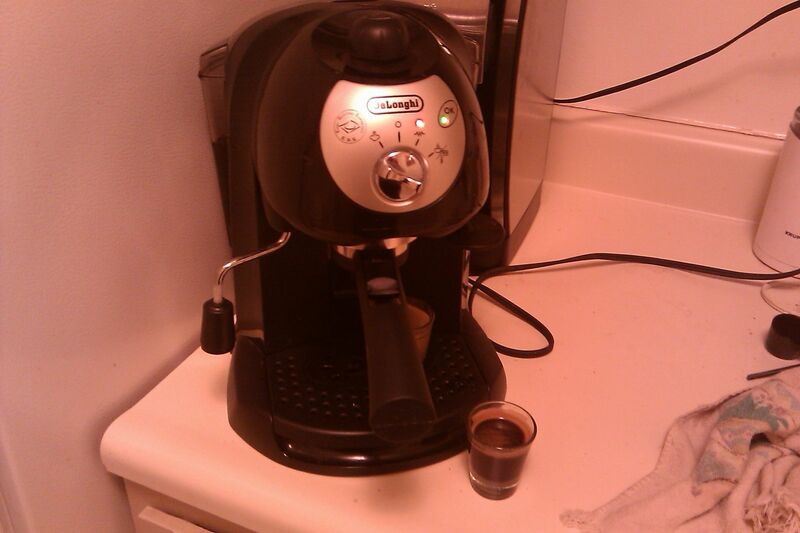 This is also known as an automatic drip coffee machine. Contact time between the coffee grinds and the hot water will dictate what compounds will be extracted from the beans. As you can imagine, there are probably thousands of different compounds in a coffee bean, and, since water is a poor solvent, even hot water won’t extract some of the finer organic flavors and aromas that are locked away in the coffee grinds. Lets establish that a pot of automatic drip takes between 8 and 12 minutes to brew. In espresso brewing, the trick is to apply some pressure in addition to heat to extract some of the goodness. So as your hot water (mobile phase) passes through your espresso (stationary phase), it takes with it some of the compounds that you wouldn’t get with an automatic drip, by sheer brute force (aka pressure). There are three things you need to worry about when brewing espresso in a pump machine: the grind, the dose, and the tamp. I can go off on tangents for each of these, but all you really need to know is that espresso grind is a lot finer than automatic drip. Why? you might ask. Well, in a normal espresso pull, the water is in contact with the coffee for a total of 22-30 seconds (if you dose and tamp correctly). Compared with the 8-12 minutes for an automatic drip, there’s no way you’d extract anything in that short a period of time; more scientifically speaking, the finer grind helps generate back pressure on the pump to ensure proper extraction. So hypothetically speaking, you pour a cup of automatic drip into a clear glass. What’s it look like? Like brown water. If you pull an espresso shot into a clear glass, you get brown water with a decent layer of foam on top. This foam is referred to as crema. So why is it floating on top? Well that’s because those components are oils (and things soluble in oils) that are not miscible with water. So you take a sip of each. Go ahead, add sugar, jeez. The brown liquid in each taste similar, but the espresso is noticeably more concentrated. Yeah, well, because the hot water moves through the coffee quicker, it is able to get the “coffee components” into the solution faster, and since you only are pulling for half a minute, you only collect one to two ounces of liquid. I can guarantee you, that if there were a way to magically concentrate a cup of automatic drip coffee down to one or two ounces, it would taste almost exactly like the espresso – minus the crema. The crema is the best part of the espresso. It contains all of the sweet aromas and flavors that make espresso a superior method of coffee delivery. I implore all of you to visit a coffee shop (even a Starbucks), and try the taste test side by side. At first, the difference in strength between espresso and automatic drip may be overwhelming, but give your palate a few seconds to acclimate, and you will appreciate the goodness locked inside of a shot of espresso. Ohh yea. I fixed my espresso maker!!! MMMMMMMMMM!!! Since espresso extraction is akin to an isocratic HPLC separation and your desired analyte is the crema which is full of nice sweet hydrophilic compounds, why not just collect a smaller fraction (pull a shorter shot) and forget about over-extracting and getting all the nasty bitter alkaloids? Also this post got me thinking, why use water as the solvent for the extraction? What would an espresso shot taste like if you used a different mobile phase like ethanol? I know the hooch would make something that wasn’t a great morning beverage but it could be fun to try.Also, I know this is a late response, but, don’t get a super-automatic machine. It takes all the fun out of making espresso by limiting the number of variables you can play with as a scientist and we scientists love variables. Buy a Gaggia or a Rancillio Silvia and a real nice conical burr grinder which would total half the price of most super-autos and produce a much better shot. Finally, I want more espresso posts. You seem to know your coffee, so when I say that your first point (pulling a shorter shot) is actually very common, it shouldnt be a big surprise. It’s called “ristretto” and normally is 1/2 to 2/3 the normal pull time. Thanks for the info. Believe it or not, more espresso posts are on the way, and I’m not just saying that because you reminded me. I’ve actually had a few things floating around in my head that I want to get on the blog! Thanks for reading!